Our wireless license plate backup camera is made from hard, rugged plastic that is built to last. It is 100% weatherproof, so don't stress out if starts raining – just set it and forget it. Installing this license plate backup camera is a breeze. You don't have to worry about drilling holes, installing mounting brackets, or modifying your vehicle in any way. Just screw your current license plate screws through the camera's brackets and you are good to go. For even more added convenience, it is also wireless up to 150ft. All wireless parts are built into the camera housing so there are no extra parts to install your rear view camera. The 120° viewing angle is perfect for cars, trucks, and SUVs. A wide view of the right, left, and rear of your vehicle makes blind spots a thing of the past. You can even adjust the exact angle that the camera faces to get the best possible view for your specific vehicle. The color mirrored image provides incredible picture quality so that you can focus on every detail, and the military-grade night vision ensures that you can use this camera whenever necessary. This versatile camera can be used constantly while driving or set to activate only when you are backing up. 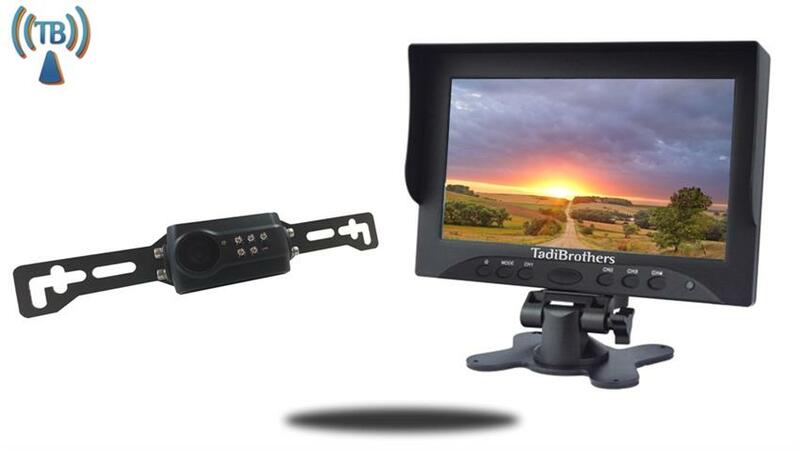 If you are in the market for a quality wireless license plate backup camera, TadiBrothers has you covered. Our years of expertise, quality products, and low prices are why informed shoppers choose us for their vehicle camera needs. We provide you with 24/7 tech support, and our knowledgeable staff is always willing to help with any questions you may have. Call us anytime at (866) 966-5550, or simply place your order online. Our secure website makes buying the camera products that you need convenient and safe. Buy a wireless license plate backup camera today and prevent an accident tomorrow! This camera is also a wireless camera so there is no need to run cables through your Car or RV. TadiBrothers only sells one type of wireless camera because its the ONLY one on the market that is a reliable rear view backup camera.
" This is a great camera, I strongly recommend using it on trucks or vans I actually use it with my ford F150 and I love it. I read a few reviews about how to parent before I got the product, but amazingly enough it was already paired out of the box. What I mean is when I turned on the camera and the model that they were already working." "Six months ago I purchased this camera with another RV camera for my fifth wheel. It worked right out of the box however about a month ago I change my truck to a new one (new to me). Somewhere along the way the camera lost its connection with the monitor and I had to go through the pairing process again. I never did it the first time because it already was paired when I bought it out of the box however one quick call to the service department they texted me a short video on how to. And boom it was done the picture is perfect on the RV camera and the license camera but I have to say that the service I received was top notch this is what service is supposed to be. Six months after I purchased the item they treated me like they were trying like I got it a week a somewhere along the way the camera lost its connection with the monitor and I had to go through the pairing process again. I never did it the first time because it already was paired when I bought it out of the box however one quick call to the service department they texted me a short video on how to. And boom it was done the picture is perfect on the RV camera and the license camera but I have to say that the service I received was top notch this is what service is supposed to be. Six months after I purchased the item they still treated me like a king. I strongly recommend buying this camera just on the fact of how amazing the tech service department was when I called them. " " Two months ago I purchased a license plate camera system from another company and spent eight hours trying to install I called their service department multiple times but they refused to help me. I decided to return the product and buy it from Tadibrothers because I heard that Tadibrothers is the best. And the truth is they were. I ordered the camera from them and while I was trying to install it I had a few difficulties Tadibrothers help me every step of the way. They even had short one minute videos that were texted to me showing me what the next step would be in my installation. That was amazing. I love the product the picture is great the reception is excellent and the service was top notch. Thank you Tadibrothers A+++"
"I Purchased this camera for my husband in Christmas he only got around to installing it in the middle of February. While installing it my husband drop the screen and broke the mount. One phone call to Tadibrothers and they sent him a new mount the next day. They did not have to do that, they were very nice and I just wanted to say thank you and have everybody know how helpful Tadibrothers was Thank you thank you thank you"